With its distinctive "Tuuuut Tuuuut" the small locomotive loaded with small plates, comes to Froschis steam locomotive table and makes its winding way on the rails to the children. Like that, the food tastes even better! Boring vegetables? No way! In the children's restaurant, the kids get their healthy greens of course served on of colorful, funny children's plates. Crayons and painting sheets provide child-friendly entertainment in the restaurant and our clown Happy regularly gives the children a short visit in the evening, always together with our Froschi. This guarantees a great mood and lots of fun at Froschis steam locomotive table. In addition to fresh and healthy vegetables, there are of course also sweet treats for dessert, such as delicious Kaiserschmarrn. 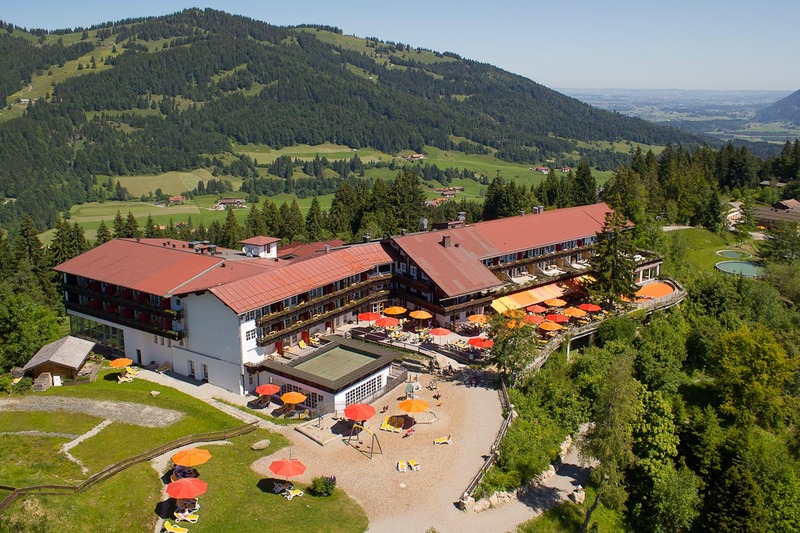 And as a popular family-friendly hotel, we have everything needed even for the smallest ones at the Allgäuer Berghof: In the children's restaurant, there are plenty of high chairs, bibs and spoons, a varied baby buffet with organic food, baby formula and baby food in jars. We want the whole family to feel comfortable with us. Especially important for our family-friendly hotel: Our sincere staff, which is of course also always courteous to the adults.